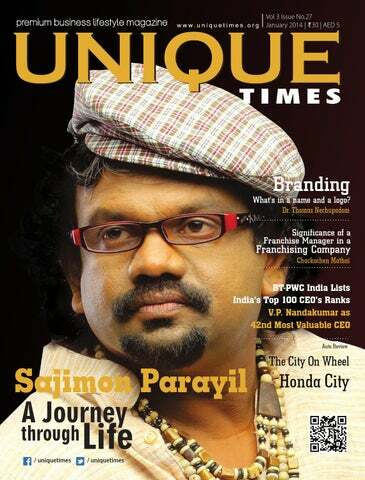 importance of branding for a business and Mr.Chackochen Mathai writes about the significance of a franchising manager in a franchising company and also we have the review of the new Honda City. Once again I would like to thank you all for your peerless support. Hope you will enjoy this edition. I wish you a delightful new year. the development of the mines would not affect the construction of the thermal station. The coal ministry has also said that if the firms fail to give reasons for the delays it would be presumed that it has no explanation to offer and the appropriate action will be taken against the company. Nine companies have qualified in the first bidding round for the Odisha UMPP and will most likely be participating in the second and final round. annum. The telecom company had been reporting the outcome of its extraordinary general meeting (EGM). "Significant growth in the size and complexity of the business of the company, remuneration structure in the telecom industry, his profile, position, experience, qualification and above all his outstanding performance justifies suitable increase in the remuneration payable to the MD,"stated the company in a note. Mr. Kapania had been appointed the MD of the company as of April 1, 2011 for a period of five years. the two year extension to Mr. Rao might most likely open up the doors for several other PSU chiefs, like ONGC's Sudhir Vasudeva to get a service term that is beyond sixty years. This is become the first case of a Navaratna PSU head being given an extension if Prime Minister Manmohan Singh decided to approve the extension. However the UPA government has opposed granting the extension beyond the superannuation so far. equipment gear maker ZTE for the new 4G network. Aircel chief marketing officer Anupam Vasudev stated that they "are happy to partner with ZTE for the deployment of our 4G LTE Networks in India. With this association, we are confident in delivering next-generation networks, critical to meet the growing demand of data in the country," In the first stage, the LTE deployment will be starting off in Chennai, rest of Tamil Nadu and a few other of the critical business circles. opportunities for about 25,000 people in Uttar Pradesh. The UP government has awarded the project to Vamasundari investments. About 60 acres of the IT city will be allotted to IT and ITeS including a hi-tech skill development center with a capacity to train more than 5000 people. The remaining 40 acres is to be supporting infrastructure and the initiates of social impact. UP Chief Minister Akhilesh Yadav said that the "IT City shall play a crucial role in the overall economic development and boost up industrial growth of the state. Apart from this, it will directly create approximately 25,000 job opportunities for the youth of the state." has stated that this will be allowing them to work on setting up a joint venture with the Tata group firm Trent. Tesco has become the first global retailer who has received approval to enter India's multi brand retail sector from the investment board since the government has allowed 51 percent of the foreign direct investment in the segment in September last year. agreement with Trent in order to provide expertise and technical capability to support the Indian firm in running the hypermarket business under the Star Bazaar stores. business to Microsoft. Ovesen joined NSN in the year of 2011 when it was still a joint venture between Nokia and Siemens, and will be continuing for a while as an advisor after the mobile phone business has been transferred to Microsoft according to Nokia. The markets are expecting more details on the new management structure at Nokia and its equipment business to be announced after the deal is closed in the first quarter of the year of 2014. Holdings Bhd. The Malaysia Airports already hold a 20 percent stake in the airport. Turkish firm Limak owns 40 percent and GMR acquired the operating rights to the airport for 20 years for 1.93 billion euros in the year of 2007. GMR, whose business interests included airport, power and roads has been divesting stakes to cut its debt load. Earlier this year, it exited a Singapore power project for $532 million. It also sold its majority stake in a highway project in India for about $35 million. the year of 2013 with Subrata Roy Sahara thus facing the toughest time in the Supreme Court which restrained him from leaving India. The year has also seen several multinational giants like Finish mobile maker Nokia rushing to the high court in a high stake tax dispute while Vedanta Group, Korean steel major Posco and Swiss pharma firm Novartis were engaged in Supreme Court on issues which ranged from industrial pollution, licences to patent. for committing at least $50 billion worth of share buyback. The proposal which was made by the High River Limited Partnership and Icahn partners will be put to vote at the company's annual shareholder meeting which has been scheduled for February 28th 2014. Upon recommending voting against the proposal, Apple's board along with the management team have said that they are thoughtfully considering options for returning the additional cash to the shareholders and are currently seeking input from shareholders as part of the company's regular review. MD and CEO of Manappuram Finance Mr.V.P. Nandakumar has been listed amongst BTPWC's Top 100 CEO's falling at the 42nd ranking in the mid-sized category of Rs. 1,500- 5,999 crore. market conditions to deliver stunning results. To show who these companies are the BT-PWC India has listed India's top 100 CEOs. First off BT500 listed India's most valuable companies, and then the winners of the BT-PWC India's Best CEO's of 2013 was picked out. The companies which had losses in any of the previous three fiscal years, were listed during that period, the companies where the CEO's were not in charge for the full period, and whose fiscal reporting period was not between 9 and 15 months and those whose annual reports were not available till 6 pm on October 24th of 2013 were eliminated. The data which was used was extracted from CMIE's Prowess database. The list was filtered as the total income was assessed, net profit, market cap and the return on equity over three fiscal years was also assessed. It resulted in listing out a list of Top 100 CEO's which was then sliced into 10 categories and the top companies in each of them was presented to a jury in order to have the winners chosen. Sajimon Parayil In life, we watch many people struggle and there have been many who have suffered much to get where are they are today. "If someone were to ask me where is the place where they can get jack fruits in Mundakayam, and how many jack fruits can load a jeep or minivan, even if someone had woke me up from my sleep, I would be able to tell, because I was doing all these jobs,"
The company Bits Groups first in Yanbu known to be the second industrial city of Saudi Arabia with just four employees. Now Bits Groups is known to be one of the largest multi disciplined company in the Middle East, Far East and South Asia. stardom that they have now." methods in the oil and gas business. of purification that it becomes gold. The Bits Indiana which happens to be the world's first exclusive linen readymade for men, women and kids. With show rooms all over India, the company has linen products that are designed and manufactures by their own studio and units. fashion designer, the judge for Miss. sensibility and goodness of its youth." What's in a name and a logo? W One of the most important things which anyone should be remembering is that the aim of your business is to make a name in the industry. The company name which is basically the product name comes about, and that product name has to be something which will make the consumer's stop their pacing and have them enter the store out of curiosity and excitement. A key factor in being able to brand your product is the logo and the colors used for your company or product. minds of the common everyday consumer as in todays market it is the brand which is given more attention too. When you mention to an individual today of the younger generation the word apple, more than likely they will not be thinking of the fruit apple, but Apple the iPhone. In just mentioning the name of the brand or seeing the logo triggers the automatic memory of the brand itself.The powering of branding is something which brings the many products in the market a long way down the road though they may be similar to each other, their unique selling point make it stand out to its specific consumer's helping the brand to create loyalty within their consumer's towards their brands. support as their male counterparts. economic empowerment of women and promoting gender equality. Student, School of Business PTI. Ms.
Vietnam has the new reform policy. was not excavated by her fall. business do not run away from her. Passion is the main source of motivation to help people not easily back down before the hardships of life. recently as a medical psychologist. decided to start her own business. Women-led businesses have made a lot of progress for the last few years. In the informal economy, however, women-led enterprises do not develop as fast as those owned by men. businesswoman with a clear mind. honor so why I stop? and running their own businesses. support from their social networks. Women entrepreneurs would benefit from having access to networks where they could ask questions of each other and share experiences about running a business. lot of progress for the last few years. can manage their businesses better. A Multi-faceted Businessman The wounded experiences helped him to experiment with naive ideas and strengthened him to challenge the outdated conventional myths in business. While his sweet experience always propeled him with confidence for his future plans and projects. Ansif Global Inc (formerly Paradise Group) is going public. Mining and Exploration Ansif Global provides cutting edge machinery and technology to the mining and exploration industries. In 2010, AGI had signed an MOU with Saudi Managem Mining Company Limited in Jeddah, Saudi Arabia for supplying machinery & technology. The project covers a range of activities in mining and exploration of volcanic scoria, dolomite and basalt. And AGI took a new initiative to promote and sell the mined products in India and China. The Dolomite mineral is also certified by Indian Rubber Board, Government of India. Centrifuges Separators Ansif Global are the exclusive distributors of Zhejiang Qingji Ind Company Limited for selling their Disc Separators and Two-Stage Pusher Centrifuges in Srilanka, India, Vietnam and Malaysia. Centrifuges are manufactured under the license and whole technology from Swiss Sulzer Escher Wyss. These separators are used in Latex and Oil industry for refining. Have installed 10 machines in Srilanka in last 2 years. Cochin Herald in 1992 as a Malayalam News Paper. Cochin Herald has signed media partnership agreement with Bizxchange (A Times Group Initiative). Cochin Herald hosts, Kerala State Business Excellence Awards to recognise and accolade the state's most excellent business leaders that nourish them to grow towards the posterity, started in 2012. Ostrich Electronics In 2004 Ansif Global Inc ventured out into a business focussing on consumer electronics with brand name â&#x20AC;&#x153;Ostrichâ&#x20AC;?. On 12 Jan 2014 it is launching AVDOC in India which can stream from mobile devices to HDTV wirelessly. Technology-Innovation Ansif Global Inc focus on providing cost-effective and innovative solutions to the industry. The recent invention from AGI is the development of Anti-EMR fabric which can be used to prevent remote triggering of Explosive Devices. LEAD Kindly Light Ansif Ashraf took inspiration from the real leader whose thoughts and teachings lead as a light to thousands - Prophet Muhammad. The main business of the company is not in violation of Shari'ah. LG G Flex Price: Yet to announced The phone has a 6 inch display with a 2.2 GHz quad core snapdragon 800 processor, a 2.1 MP front camera, and 13 MP for rear camera with a 720 x 1280 pixel resolution, a 2 GB RAM and a Android 4.2 OS. The phone has 32GB storage which is nonexpandable. The price has not been announced as this curved display phone will be released only in February of 2014. Moto G Price: $179 With a 4.5 in display, this phone has a 1.3 MP front camera and a 5 MP rear camera with a 720x1280 pixels resolution. The phone has a 1GB RAM with a 1.2 GHz processor. The battery life lasts up to eight hours at least even when you use streaming video. Xolo Q2000 Rs. 14,999 This phone has a 5.5 in display with 720x1280 pixel resolution. The phone has a battery life which lasts up to a day depending on your amount of usage of course. The phone is powered by a 1.2 GHz quad core processor and runs on an Android 4.2 OS and has a 1 GB RAM, it has 8 GB of internal storage which is expandable up to 32GB. Wi-Fi is enabled. Nexus 5 Price: Rs. 28,999 This p hone has a 4.9 in HD display with a resolution of 1920 x 1080 pixels and has an 8 MP rear camera and 1.3 MP front facing camera. The phone runs on Android 4.4 OS and is powered by a quad core 2.25 GHz Qualcomm Snapdragon 800 processor with a 2 GB of RAM. The phone has an in built storage of 32 GB and does not have an expandable storage. The phone's battery life can last up to a day. Lenovo Yoga Tablet 10 Price: Rs. 28,999 This tab has a 10 in display with a 1280x800 pixels resolution. The tablet runs on Android 4.2 and is powered by 1.2 GHz quad core processor and has a 16GB inbuilt storage which is expandable up to 64GB. It has a 1.6 MP front camera and a 5 MP rear camera with Wi-Fi enabled. The battery life lasts up to 8 hours even with video playback. Acer C720 Price: 22,999 This phone has a display of 11.6 in with a resolution of 1366x768 pixels The chromebook is powered by Google's Chrome OS, and is powered by a 1.4 GHz dual core processor and has a 16GB of internal storage. The Acer lasts up to seven hours. Asus Fonepad 7 Price: 17,499 This tablet comes with a 7 in display with a 1280x800 resolution with a 5 MP autofocus rear camera and a 1.2 MP front facing camera. The Fonepad runs on Android 4.2 Jelly Bean OS and is powered by a dual core 1.6 GHz Intel Atom Z2560 processor with Hyper Threeading. The tab with a 1 GB of RAM and 16 GB of inbuilt storage which is expandable up to 32 GB. The battery life however only lasts around 5-6 hours. BlackBerry Z30 Price: Rs. 39,990 This phone has a display of 5 in with a 720x1280 resolution with a 8 MP rear camera and a 2 MP front camera. The phone has a BlackBerry OS 10.2 and is powered by a 1.7 GHz dual core Snapdragon S4 Pro processor alongside 2 GB RAM. Xbox One Price: $500 The Xbox One is not just a toy to play games on, now you can use it to watch movies, you can connect it to your cable box and watch live TV, you can Skype as well! It has a Kinect camera. Samsung Galaxy Note 3 Price: Rs. 49,900 This phone has a 5.7 in display with a 1080x1920 pixels resolution. It runs on Android 4.3 Jelly Bean and has a 13 MP rear camera and 2 MP front camera. It is powered by 1.9GHz Cortex A15 quad-core processor and a 1.3GHz Cortex A7 quadcore processor which work together to optimize processing. It has 3GB RAM, and has 32GB of expandable built-in storage. The battery life lasts up to 9-10 hours. help the entrepreneur to choose the right franchised business. He should not sell a franchise for the sake of targets. The franchise manager should also be responsible to the franchisor by selecting the right investor for the brand. Valuating the investor before making him an entrepreneur seriously lies with the franchise manager. The skills of the Franchise Managers should be of a high calibre where he needs to know a bit of psychology to assess the investor and his seriousness in the business. Today there are many investors with free money in their hand and wants to invest the same on some business for their spouse who is sitting ideal, or a brother/sister who has not found a job etc., but the person coming to take a franchise is a well learned person who is clear with his intentions to help either his spouse, brother or a relative and make them successful. But the fact is that if the franchise manager gets carried away by the looks and the knowledge of the investor without figuring out who is going to run the business, then it's a bad choice of a franchisee. handling, event organizing capacity, operational skills, branding, training, marketing and PR skills are important for a good and efficient franchise manager. Beyond that he needs to have the grace to build a long term relationship with the franchisee. Many organization makes their franchise mangers to cut the relation off and transfer the job to the next set of people who have never built a relationship in the initial stages and many managers do not even pick their calls after the sales is over. This will not help a good franchisee-franchisor relationship in the long run. A franchise manager is one who is a bridge between the franchisor and the franchisee. The manager understands both parties well and their intentions and should work towards the success of both parties. It should always be a win-win situation. The manager should look at the franchisee as a customer; therefore any decision taken should be in this line, benefit to the customer and profit to the organization that he works for. If this concept is clear in the minds of the manager the relationship will be rock solid. along with the marketing or the brand manager based on the feedback received from the consumer and the franchisee. The franchisee manager is an important person in the franchising business, both for the franchiser and the franchisee. In the current scenario there are not many who are looking at the benefit of the both the parties they look at their own benefit; finally the brand and the franchisees suffer. Therefore being an honest manager with high integrity will take him to places and he will be able to build brand. A franchisee manager should be part of the system for a longer period of time to establish stability to the organization. That will ensure brand stability too. are known to be French speaking. French and German are spoken. forests, woodlands and the alps. when and how the best. city of narrow roads and high towers. the city of Its Bern, the Swiss capital. around at a certain time of the year. You can entertain yourself with thousands of others in the month of July with the music scene as several artists from the international music world perform at the Gurten festival. where concerts are also held at times. world perform at the Gurten festival. F o u r I m p o r t a n t E l e m e n t s t o a H e a l t h y L i f e W True wealth is measured by what you have, not what you do not have or what you have lost. much more than just money. or what you have lost." things in their life – they are wealthy! opinion about two 'beautiful' people. A mountain reflected in a peaceful lake, a person who has inner peace, a cat quietly purring â&#x20AC;&#x201C; they all reflect beauty. An old saying captures the underlying meaning of beauty perfectly: "beauty lies in the eyes of the beholder." timeless and hard to define. secret somewhere along the line. desires and wait, they will come true. to develop our desires into reality. so in the future as well. It comes in a five speed manual and a CVT automatic, with seven virtual ratios and a paddle shift to toggle between them. Although it sounds a bit noisy out on the open road, the efficient CVT makes great sense in today's congested roads. driven sedately. It comes in a five speed manual and a CVT automatic, with seven virtual ratios and a paddle shift to toggle between them. Although it sounds a bit noisy out on the open road, the efficient CVT makes great sense in today's congested roads. The last gen City rides and handles rather well for its segment and the new one is no different. The steering is quite accurate and body control is good for a spirited drive. The slow speed ride is a bit harsh, but it improves considerably with speed. The narrow 175/65 R15 tyres on cheap looking wheels don't do much justice to the chassis' capabilities and quite lack the grip when it comes to high speed braking. While I got to drive the three variants of the City a month and a half prior to its launch in the first week of Jan 2014, the pricing is still unclear. The new City with its better interiors and equipments is not just a replacement for the outgoing model; it will also try and fill in the void left by the discontinued Civic. What is for sure is, Honda will continue to dominate the segment and have an even better success story to tell us at the end of the next five years. or every business team work is the most essential key to success. manner with good advice on which you can trustworthily depend on. With an ease of writing, you won't just feel as if you are reading a book, but actually interactively talking to the writer herself on how to help your team succeed. gained through many years of experience. He points out some common made assumptions, set out expectations and many other things can get in the way of running a successful business. Gerber guides you through the numerous steps of running a business, from starting out to finally being able to grow it into a big business. ou always want quick money whenever you are starting or doing a business. In the book Instant Profit Bradley J. Sugars, a worldrenowned entrepreneur, author, and business coach teaches you the ways in which you can improve your business and boost profits fast using the 4 M's of profit: management, money, marketing, and merchandise. business person you must know your advertising methods. only if your ad's are successful that your product will be a success. He talks about why some advertisements work and why some fail, and how to write headlines which will attract readers, choose graphics which can help sell your product and how to find the right appeal for your specified audience. what will help your clients say the long awaited "yes." Any salesperson can get help from this book on how to make their sales and get to the top of the charts with the most clients. his book is basically a "commonsense" approach to sales, which is based on the theory that "what" salespeople ask-and "how"
asking the right questions at the right time, you will learn to uncover the prospect's needs. With this book you will learn how to penetrate more accounts, establish greater credibility, and generate more return calls. is escaping the rat race, experiencing high-end world travel, earning a monthly five-figure income with zero management, or just living more and working less, The 4-Hour Workweek is the blueprint. ran up a $700,000 hotel tab, to the wife and kids waiting at home, and the fast-talking, hard-partying young stockbrokers who called him king and did his bidding, here, in his own inimitable words, is the story of the ill-fated genius they called him The Wolf of Wall Street.